Like a status update, but a lot more useful. Seamlessly integrated into email or Slack, check-ins give teams the opportunity to reflect on the past and share priorities for the future. With simple, customizable questions, team members get a chance to give a clear update without disrupting their momentum. These tactical responses are sent to team leaders, so action can be taken quickly. 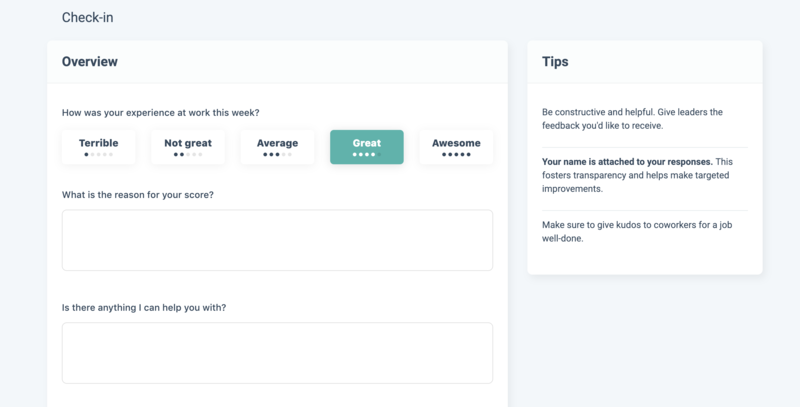 As part of this process, team members can send recognition to coworkers or submit suggestions on how to improve company processes & productivity. A few minutes each week is all it takes for team members to create a new level of team clarity. Giving the chance for people to share their thoughts creates a culture of open feedback and helps you make better decisions as a leader. You can't say thank-you enough. Recognition is part of the weekly update.